CAMP PENDLETON, Calif. – Lance Cpl. Eamonn Garber wasn’t sure things would work out, and that was bad mostly because his unit was at war. The Marines with the Operations Platoon Engineer Support Company in the 1st Combat Engineer Battalion faced an unexpected change in leadership two months after they arrived in Afghanistan, and they were worried it would derail their otherwise smooth deployment. The ubiquitous "needs of the Corps" required an engineer officer back here at the unit's home base, so their platoon commander needed to redeploy to the States. In turn, the 50 enlisted Marines were stuck with a young new boss — one without an engineering background. The Marines said they feared it could be a tough transition. When 1st. Lt. Amanda Mathew showed up to take command in December, she became the first woman to lead a deployed combat arms platoon. The young officer was riding on the forefront of a wave of changes, one that started months earlier when then-Defense Secretary Leon Panetta ordered the Pentagon to integrate women into combat arms military occupational specialties. Since then, the Corps has opened a number of combat MOSs to women, along with a slew of new billets. Still, the countdown for the service to complete integration — or otherwise apply for waivers — ends Jan. 1, 2016. And the voices of dissent and criticism have only grown more shrill, more concerted and — at times — even more cruel and ruthless with every new opening. That's the climate Mathew faced when she stepped into her new role at Camp Leatherneck in Afghanistan's Helmand province. Sgt. Joseph Cain said other Marines he ran into in Afghanistan were skeptical of their new platoon commander. "After awhile you take offense," Cain said. In the end, he and other 1st CEB Marines stood up for their new platoon commander — a first lieutenant who trusted their work, could crank out 22 pullups and quickly learned the ins-and-outs of combat engineering. Cain said he found a quick line that quickly silenced other Marines. "She's better than your lieutenant," he said he'd tell them. When the Marine Corps decided to lift some restrictions on women in combat, it made them eligible for jobs previously only held by men. That included leadership positions in combat arms platoons, a coveted job among young officers across the Corps. 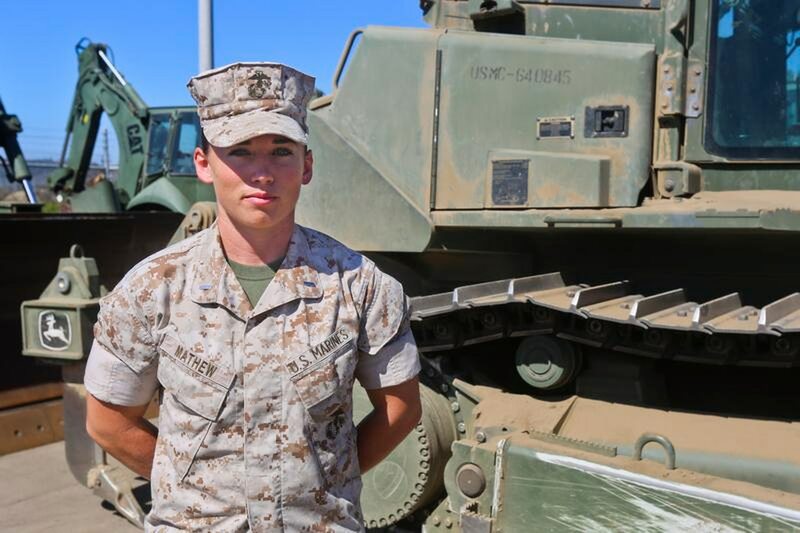 "Most, if not every junior officer wants to be a platoon commander and have that hands-on experience with the Marines, and have those kinds of decisions afforded to you," Mathew said. As the Corps assigns women to new jobs, officials and research organizations are evaluating the process and are trying to find the best way to continue integrating women across the service. By the end of 2015, the Marine Corps will complete a large-scale study and make recommendations for the commandant to consider. They're looking at Mathew and other women who perform in previously closed units in their current MOS as a part of this evaluation process. While Mathew is a test subject of sorts, Marines in her platoon said their deployment went very well. Besides that, the novelty of the situation faded just days after Mathew took over. "Besides saying, 'Good 'morning ma'am, good afternoon ma'am,' you forget," Cain said. Mathew became a combat arms platoon commander after the Marine Corps opened 19 battalions that were previously staffed only by men to women. That included combat engineer, tanks, low altitude air defense, and other units under the combat arms umbrella. The Corps previously put women only in the headquarters elements of those units, but under the new policy they would be closer to the fight. Prior to these changes, women still went outside the wire and incidentally fought and died in combat, including in the wars in Iraq and Afghanistan. But they weren't specifically assigned to a combat unit, unless they were assigned to special units like the Corps' Lioness programs. But the decision to put women closer to the fight continues to make some people uneasy. Without fail, when the topic of women in combat is raised, there's a social media frenzy, and the critics are quick to spin out the line that women aren't physically capable of doing these jobs, or they're concerned that standards will weaken. There are also concerns that the integration would change the culture of the unit, destroying cohesion. Other opponents are plainly and openly misogynistic, repeatedly making off-color jokes. Other female combat engineers faced resistance in a male-dominated world. In 2013, Gunnery Sgt. Robin Baker became the first female combat engineer gunny when she pinned on rank in Afghanistan while serving with Combat Logistics Regiment 2. She joined the Marines in 2000 and she told military public affairs that there were only four other women in her specialty training, and that some of the men she worked with questioned why she was even there, or told her that she wasn't capable of doing her job because of her gender. Those comments, however, just made her push harder, she said. In 2012, 1st. Lt. Brandy Soublet was named the first female maintenance management and logistics officer for 3rd Combat Engineer Battalion in Twentynine Palms, California. There was a brief awkwardness when she first arrived at 3rd CEB, she said. "I got some wayward looks from some young Marines," she said. But those looks quickly stopped, and she was simply viewed as the new lieutenant. Soublet is now a captain and a company officer at the U.S. Naval Academy. Two years after the Pentagon announced the changes, the integration of women in combat continues to weigh on the minds of young Marines. When Defense Secretary Chuck Hagel addressed Marines here in August, one female Marine asked him for his views of women in combat. Hagel said he was satisfied with the way the Corps has integrated its units so far, and that the service was moving diligently to open up positions to women without lowering standards. Besides putting women like Mathew into combat units, the Corps has three other simultaneous efforts to integrate women. In June, the Corps stood-up the Ground Combat Elemental Integrated Task Force, a group of about 500 Marines, both men and women, who will serve as volunteer test subjects. Researchers from universities and think tanks will study how they physically complete various combat-oriented tasks. Capt. Maureen Krebs, a Marine Corps spokeswoman, said that they're determining the physical demands and gender-neutral occupational requirements for these tasks, and then they'll find ways to make sure that the best and most qualified Marines can compete and receive combat arms jobs. The volunteers will complete entry-level schools for baseline training before they start testing at Camp Lejeune, North Carolina. The Corps also opened 11 MOSs that they have determined do not need additional research before including women. And finally, the Corps is expanding research at entry-level training schools to get more data and make a more informed recommendation on how to include women. Mathew's unit deployed in October, and she learned she was going to become a platoon commander about two months later. Her executive officer told her to start learning how to lead a combat engineer platoon, but she said she only had a week to prepare before she took charge. Since she said she couldn't possibly master everything she needed to know about the three-section platoon that quickly, she oriented herself enough to steer the platoon. She knew she'd have to turn to the Marines for guidance, she said. Her Marines said that willingness to learn about what they did established trust and helped build a solid relationship. "She would learn so she could lead better," Garber, the lance corporal, said. "She would come around and she would learn about our gear, how it operates. She did maintenance with us once." Cain said that showed the Marines she trusted their expertise. She didn't ask questions to hit them with a pop quiz, but to tap into their knowledge, he said, which was different from a lot of other leaders he worked with. While Baker and Soublet both had some tense moments when stepping into new roles as women, Mathew said she had a different experience. "Marines are going to be loud and obnoxious and absolutely ridiculous, but at the end of the day they are a group of absolute professionals that are going to get the mission done and get it done very well," she said. "I was received very well. I didn't have the impression that I need to prove myself. It's more that I needed to accomplish the mission and take care of the Marines." Sgt. Maj. Dan Krause, the top enlisted Marine with 1st CEB, said he didn't hear anyone take issue that Mathew is a woman. "It didn't come up at all," he said. The MOSs that compose a combat engineer battalion go to school and train with women, so the male Marines are more used to working with females, he said. "It wasn't like she was an infantry platoon commander all the sudden," he said. Besides that, Mathew is an exemplary young officer, so Marines were going to respect her anyway, he said. "She definitely leads from the front, the way she carries herself, the way she looks in uniform, her physical fitness," he said. "She has everything you look for in a Marine officer."